Auto-failover groups is a SQL Database feature that allows you to manage replication and failover of a group of databases on a SQL Database server or all databases in a Managed Instance to another region (currently in public preview for Managed Instance). It uses the same underlying technology as active geo-replication. You can initiate failover manually or you can delegate it to the SQL Database service based on a user-defined policy. The latter option allows you to automatically recover multiple related databases in a secondary region after a catastrophic failure or other unplanned event that results in full or partial loss of the SQL Database service’s availability in the primary region. Additionally, you can use the readable secondary databases to offload read-only query workloads. Because auto-failover groups involve multiple databases, these databases must be configured on the primary server. Both primary and secondary servers for the databases in the failover group must be in the same subscription. Auto-failover groups support replication of all databases in the group to only one secondary server in a different region. When working with single or pooled databases on a SQL Database server and you want multiple secondaries in the same or different regions, use active geo-replication. When you are using auto-failover groups with automatic failover policy, any outage that impacts one or several of the databases in the group results in automatic failover. In addition, auto-failover groups provide read-write and read-only listener end-points that remain unchanged during failovers. Whether you use manual or automatic failover activation, failover switches all secondary databases in the group to primary. After the database failover is completed, the DNS record is automatically updated to redirect the endpoints to the new region. For the specific RPO and RTO data, see Overview of Business Continuity. After failover, ensure the authentication requirements for your server and database are configured on the new primary. For details, see SQL Database security after disaster recovery. A failover group is a group of databases managed by a single SQL Database server or within a single managed instance that can fail over as a unit to another region in case all or some primary databases become unavailable due to an outage in the primary region. With SQL Database servers, some or all of the user databases on a single SQL Database server can be placed in a failover group. Also, a SQL Database server supports multiple failover groups on a single SQL Database server. With managed instance, a failover group contains all user databases in the Managed Instance and therefore a Managed Instance only supports a single failover group. The SQL Database server or Managed Instance that hosts the primary databases in the failover group. The SQL Database server or Managed Instance that hosts the secondary databases in the failover group. The secondary cannot be in the same region as the primary. You can put several single databases on the same SQL Database server into the same failover group. If you add a single database to the failover group, it automatically creates a secondary database using the same edition and compute size on secondary server. You specified that server when the failover group was created. If you add a database that already has a secondary database in the secondary server, that geo-replication link is inherited by the group. When you add a database that already has a secondary database in a server that is not part of the failover group, a new secondary is created in the secondary server. In a Managed Instance, all user databases are replicated. You cannot pick a subset of user databases for replication in the failover group. You can put all or several databases within an elastic pool into the same failover group. If the primary database is in an elastic pool, the secondary is automatically created in the elastic pool with the same name (secondary pool). You must ensure that the secondary server contains an elastic pool with the same exact name and enough free capacity to host the secondary databases that will be created by the failover group. If you add a database in the pool that already has a secondary database in the secondary pool, that geo-replication link is inherited by the group. When you add a database that already has a secondary database in a server that is not part of the failover group, a new secondary is created in the secondary pool. A DNS CNAME record formed that points to the current primary's URL. It allows the read-write SQL applications to transparently reconnect to the primary database when the primary changes after failover. On a SQL Database server, the DNS CNAME record for the failover group that points to the current primary's URL is formed as failover-group-name.database.windows.net. On a Managed Instance, the DNS CNAME record for the failover group that points to the current primary's URL is formed as failover-group-name.zone_id.database.windows.net. A DNS CNAME record formed that points to the read-only listener that points to the secondary's URL. It allows the read-only SQL applications to transparently connect to the secondary using the specified load-balancing rules. On a SQL Database server, the DNS CNAME record for the read-only listener that points to the secondary's URL is formed as failover-group-name.secondary.database.windows.net. On a Managed Instance, the DNS CNAME record for the read-only listener that points to the secondary's URL is formed as failover-group-name.zone_id.database.windows.net. By default, a failover group is configured with an automatic failover policy. The SQL Database service triggers failover after the failure is detected and the grace period has expired. The system must verify that the outage cannot be mitigated by the built-in high availability infrastructure of the SQL Database service due to the scale of the impact. If you want to control the failover workflow from the application, you can turn off automatic failover. By default, the failover of the read-only listener is disabled. It ensures that the performance of the primary is not impacted when the secondary is offline. However, it also means the read-only sessions will not be able to connect until the secondary is recovered. If you cannot tolerate downtime for the read-only sessions and are OK to temporarily use the primary for both read-only and read-write traffic at the expense of the potential performance degradation of the primary, you can enable failover for the read-only listener. In that case the read-only traffic will be automatically redirected to the primary if the secondary is not available. Return the databases to the primary region after the outage has been mitigated (failback). Unplanned or forced failover immediately switches the secondary to the primary role without any synchronization with the primary. This operation will result in data loss. Unplanned failover is used as a recovery method during outages when the primary is not accessible. When the original primary is back online, it will automatically re-connect without synchronization and become a new secondary. Because the primary and secondary databases are synchronized using asynchronous replication, the failover may result in data loss. You can customize the automatic failover policy to reflect your application’s tolerance to data loss. By configuring GracePeriodWithDataLossHours, you can control how long the system waits before initiating the failover that is likely to result data loss. You can configure multiple failover groups for the same pair of servers to control the scale of failovers. Each group fails over independently. If your multi-tenant application uses elastic pools, you can use this capability to mix primary and secondary databases in each pool. This way you can reduce the impact of an outage to only half of the tenants. Managed Instance does not support multiple failover groups. Permissions for a failover group are managed via role-based access control (RBAC). The SQL Server Contributor role has all the necessary permissions to manage failover groups. To create a failover group, you need RBAC write access to both the primary and secondary servers, and to all databases in the failover group. For a managed instance, you need RBAC write access to both the primary and secondary managed instance, but permissions on individual databases are not relevant since individual managed instance databases cannot be added to or removed from a failover group. To update a failover group, you need RBAC write access to the failover group, and all databases on the current primary server or managed instance. To fail over a failover group, you need RBAC write access to the failover group on the new primary server or managed instance. 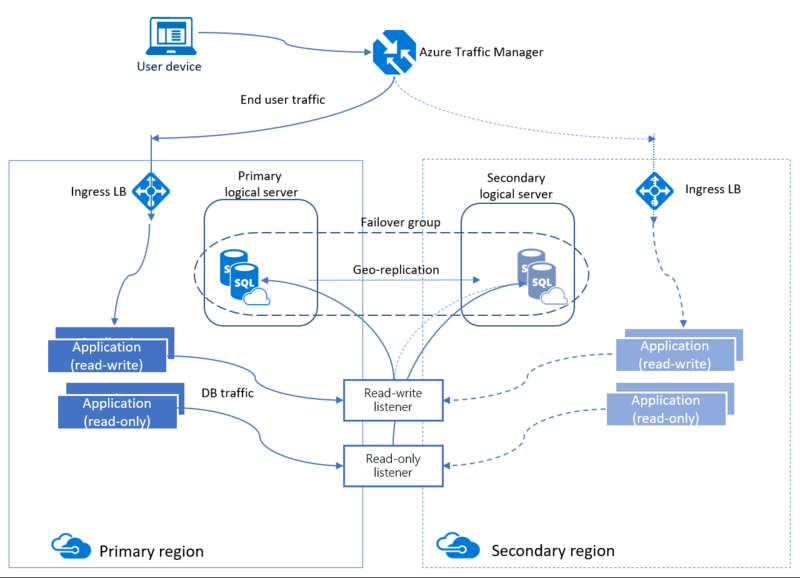 The auto-failover group must be configured on the primary SQL Database server and will connect it to the secondary SQL Database server in a different Azure region. The groups can include all or some databases in these servers. The following diagram illustrates a typical configuration of a geo-redundant cloud application using multiple databases and auto-failover group. One or many failover groups can be created between two servers in different regions (primary and secondary servers). Each group can include one or several databases that are recovered as a unit in case all or some primary databases become unavailable due to an outage in the primary region. The failover group creates geo-secondary database with the same service objective as the primary. If you add an existing geo-replication relationship to the failover group, make sure the geo-secondary is configured with the same service tier and compute size as the primary. When performing OLTP operations, use failover-group-name.database.windows.net as the server URL and the connections are automatically directed to the primary. This URL does not change after the failover. Note the failover involves updating the DNS record so the client connections are redirected to the new primary only after the client DNS cache is refreshed. If you have a logically isolated read-only workload that is tolerant to certain staleness of data, you can use the secondary database in the application. For read-only sessions, use failover-group-name.secondary.database.windows.net as the server URL and the connection is automatically directed to the secondary. It is also recommended that you indicate in connection string read intent by using ApplicationIntent=ReadOnly. SQL failover decision is independent from the rest of the application or other services used. The application may be “mixed” with some components in one region and some in another. To avoid the degradation, ensure the redundant application deployment in the DR region and follow these network security guidelines. The application in the DR region does not have to use a different connection string. If an outage is detected, SQL waits for the period you specified by GracePeriodWithDataLossHours. The default value is 1 hour. If you cannot afford data loss, make sure to set GracePeriodWithDataLossHours to a sufficiently large number, such as 24 hours. Use manual group failover to fail back from the secondary to the primary. Elastic pools with 800 or fewer DTUs and more than 250 databases using geo-replication may encounter issues including longer planned failovers and degraded performance. These issues are more likely to occur for write intensive workloads, when geo-replication endpoints are widely separated by geography, or when multiple secondary endpoints are used for each database. Symptoms of these issues are indicated when the geo-replication lag increases over time. This lag can be monitored using sys.dm_geo_replication_link_status. If these issues occur, then mitigations include increasing the number of pool DTUs, or reducing the number of geo-replicated databases in the same pool. The auto-failover group must be configured on the primary instance and will connect it to the secondary instance in a different Azure region. All databases in the instance will be replicated to the secondary instance. The following diagram illustrates a typical configuration of a geo-redundant cloud application using managed instance and auto-failover group. Auto-failover groups for Managed Instance is in public preview. When a new instance is created, a unique id is automatically generated as the DNS Zone and included in the instance DNS name. A multi-domain (SAN) certificate for this instance is provisioned with the SAN field in the form of zone_id.database.windows.net. This certificate can be used to authenticate the client connections to an instance in the same DNS zone. To ensure non-interrupted connectivity to the primary instance after failover both the primary and secondary instances must be in the same DNS zone. When your application is ready for production deployment, create a secondary instance in a different region and make sure it shares the DNS zone with the primary instance. This is done by specifying a DNS Zone Partner optional parameter using the Azure portal, PowerShell, or the REST API. For more information about creating the secondary instance in the same DNS zone as the primary instance, see Managing failover groups with Managed Instances (preview). The failover group will manage the failover of all the databases in the instance. When a group is created, each database in the instance will be automatically geo-replicated to the secondary instance. You cannot use failover groups to initiate a partial failover of a subset of the databases. If a database is removed from the primary instance, it will also be dropped automatically on the geo secondary instance. When performing OLTP operations, use failover-group-name.zone_id.database.windows.net as the server URL and the connections are automatically directed to the primary. This URL does not change after the failover. The failover involves updating the DNS record, so the client connections are redirected to the new primary only after the client DNS cache is refreshed. Because the secondary instance shares the DNS zone with the primary, the client application will be able to re-connect to it using the same SAN certificate. If you have a logically isolated read-only workload that is tolerant to certain staleness of data, you can use the secondary database in the application. 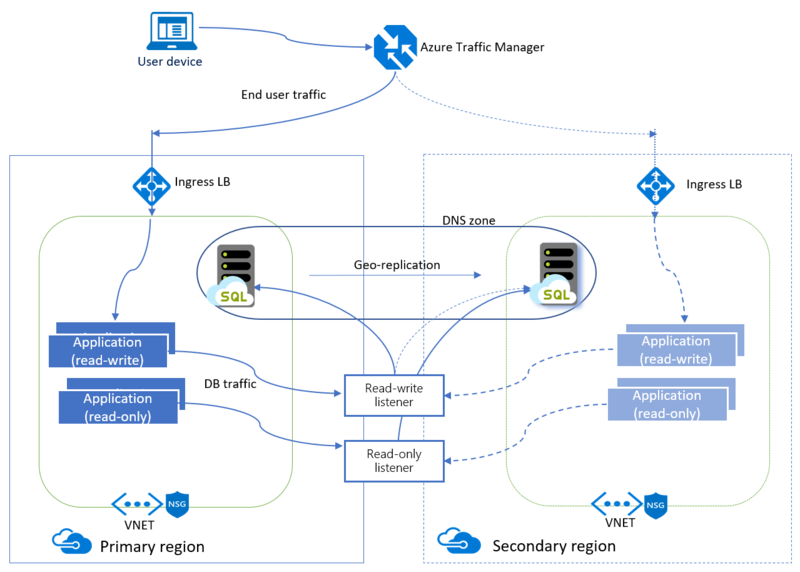 To connect directly to the geo-replicated secondary, use server.secondary.zone_id.database.windows.net as the server URL and the connection is made directly to the geo-replicated secondary. In certain service tiers, Azure SQL Database supports the use of read-only replicas to load balance read-only query workloads using the capacity of one read-only replica and using the ApplicationIntent=ReadOnly parameter in the connection string. When you have configured a geo-replicated secondary, you can use this capability to connect to either a read-only replica in the primary location or in the geo-replicated location. To connect to a read-only replica in the primary location, use failover-group-name.zone_id.database.windows.net. To connect to a read-only replica in the secondary location, use failover-group-name.secondary.zone_id.database.windows.net. If an outage is detected, SQL automatically triggers read-write failover if there is zero data loss to the best of our knowledge. Otherwise, it waits for the period you specified by GracePeriodWithDataLossHours. If you specified GracePeriodWithDataLossHours, be prepared for data loss. In general, during outages, Azure favors availability. If you cannot afford data loss, make sure to set GracePeriodWithDataLossHours to a sufficiently large number, such as 24 hours. The DNS update of the read-write listener will happen immediately after the failover is initiated. This operation will not result in data loss. However, the process of switching database roles can take up to 5 minutes under normal conditions. Until it is completed, some databases in the new primary instance will still be read-only. If failover is initiated using PowerShell then the entire operation is synchronous. If it is initiated using the Azure portal then the UI will indicate completion status. If it is initiated using the REST API, use standard Azure Resource Manager’s polling mechanism to monitor for completion. Use manual group failover to move primaries back to the original location. When the outage that caused the failover is mitigated, you can move your primary databases to the original location. To do that you should initiate the manual failover of the group. For some applications the security rules require that the network access to the data tier is restricted to a specific component or components such as a VM, web service etc. This requirement presents some challenges for business continuity design and the use of the failover groups. You should consider the following options when implementing such restricted access. Initiate manual failover when the outage is detected. This option is optimized for the applications that require consistent latency between the front-end and the data tier and supports recovery when either front end, data tier or both are impacted by the outage. If you are using the read-only listener to load-balance a read-only workload, make sure that this workload is executed in a VM or other resource in the secondary region so it can connect to the secondary database. Create a public load balancer and assign the public IP to it. Create network security group and configure inbound connections. Ensure that the outbound connections are open to Azure SQL database by using ‘Sql’ service tag. Create a SQL database firewall rule to allow inbound traffic from the public IP address you create in step 1. For more information about on how to configure outbound access and what IP to use in the firewall rules, see Load balancer outbound connections. The above configuration will ensure that the automatic failover will not block connections from the front-end components and assumes that the application can tolerate the longer latency between the front end and the data tier. To guarantee business continuity for regional outages you must ensure geographic redundancy for both front-end components and the databases. The two Managed Instances need to be in different Azure regions. Your secondary must be empty (no user databases). The primary and secondary Managed Instances need to be in the same Resource Group. The VNets that the Managed Instances are part of need to be connected through a VPN Gateway. Global VNet Peering is not supported. The two Managed Instance VNets cannot have overlapping IP addresses. Misconfigured NSG security rules leads to stuck database copy operations. You need to configure DNS zone partner on secondary instance. A DNS zone is a property of a Managed Instance. It represents the part of host name that follows Managed Instance name and precedes the .database.windows.net prefix. It is generated as random string during the creation of the first Managed Instance in each VNet. The DNS zone cannot be modified after the creation of managed instance, and all Managed Instances within the same subnet share the same DNS zone value. For Managed Instance failover group setup, the primary Managed Instance and the secondary Managed Instance must share the same DNS zone value. You accomplish this by specifying the DnsZonePartner parameter when creating the secondary Managed Instance. The DNS zone partner property defines the Managed Instance to share an instance failover group with. By passing into the resource id of another managed instance as the input of DnsZonePartner, the Managed Instance currently being created inherits the same DNS zone value of the partner Managed Instance. You can upgrade or downgrade a primary database to a different compute size (within the same service tier, not between General Purpose and Business Critical) without disconnecting any secondary databases. When upgrading, we recommend that you upgrade all of the secondary databases first, and then upgrade the primary. When downgrading, reverse the order: downgrade the primary first, and then downgrade all of the secondary databases. When you upgrade or downgrade the database to a different service tier, this recommendation is enforced. This sequence is recommended specifically to avoid the problem where the secondary at a lower SKU gets overloaded and must be re-seeded during an upgrade or downgrade process. You could also avoid the problem by making the primary read-only, at the expense of impacting all read-write workloads against the primary. If you created secondary database as part of the failover group configuration it is not recommended to downgrade the secondary database. This is to ensure your data tier has sufficient capacity to process your regular workload after failover is activated. Due to the high latency of wide area networks, continuous copy uses an asynchronous replication mechanism. Asynchronous replication makes some data loss unavoidable if a failure occurs. However, some applications may require no data loss. To protect these critical updates, an application developer can call the sp_wait_for_database_copy_sync system procedure immediately after committing the transaction. Calling sp_wait_for_database_copy_sync blocks the calling thread until the last committed transaction has been transmitted to the secondary database. However, it does not wait for the transmitted transactions to be replayed and committed on the secondary. sp_wait_for_database_copy_sync is scoped to a specific continuous copy link. Any user with the connection rights to the primary database can call this procedure. sp_wait_for_database_copy_sync prevents data loss after failover, but does not guarantee full synchronization for read access. The delay caused by a sp_wait_for_database_copy_sync procedure call can be significant and depends on the size of the transaction log at the time of the call. For information about using point-in-time restore with failover groups, see Point in Time Recovery (PITR). As discussed previously, auto-failover groups and active geo-replication can also be managed programmatically using Azure PowerShell and the REST API. The following tables describe the set of commands available. Active geo-replication includes a set of Azure Resource Manager APIs for management, including the Azure SQL Database REST API and Azure PowerShell cmdlets. These APIs require the use of resource groups and support role-based security (RBAC). For more information on how to implement access roles, see Azure Role-Based Access Control. For a sample script, see Configure and failover a failover group for a single database. Update the PowerShellGet module to 1.6.5 (or newest preview version). See PowerShell preview site. Failover (Planned) Fails over from the current primary server to this server. Force Failover Allow Data Loss ails over from the current primary server to this server. This operation might result in data loss. Get Failover Group Gets a failover group. List Failover Groups By Server Lists the failover groups in a server. Update Failover Group Updates a failover group. List Failover Groups - List By Location Lists the failover groups in a location. To learn about Azure SQL Database automated backups, see SQL Database automated backups. To learn about using automated backups for recovery, see Restore a database from the service-initiated backups. To learn about authentication requirements for a new primary server and database, see SQL Database security after disaster recovery.